Jack White's self-introduction during a New York Public Library event last night was surprising not just in its modesty, but also for what he left out. In preparation for the evening's public listening session, titled "Exploring the Rise and Fall of Paramount Records," Paul Holdengräber, the NYPL's director of public programs, asked each of the event's five guest speakers to provide a seven-word synopsis of themselves. As Holdengräber read the descriptions aloud, it seemed odd that White's choice of words ("son, altar boy, busboy, upholsterer, drummer, father") omitted "guitarist," his best-known role since co-founding the White Stripes. The words "blues fan" were also absent from that intro, but no matter: The entire evening left no doubt about White's deep and long-professed admiration for American roots music. He shared the stage with Princeton professor Daphne Brooks ("Tower Records, Friday night, black girl, bibliophile") and critic Greil Marcus (no description offered), as well as brothers Dean and Scott Blackwood, who tapped White to help produce the bodacious new limited-edition reissue project The Rise and Fall of Paramount Records, 1917-1932, Vol. 1 a collaboration between Revenant Records and White's own Third Man imprint that excavates the label started by a Wisconsin-based furniture company in order to help sell wood cabinets for early phonographs. The box, the first of two, has drawn as much comment for its price tag ($400) and elaborate multimedia packaging (it contains 800 songs on a flash drive, several LPs, and two booklets) as the sounds within. Paramount got in on the ground floor of recording African-American music, a.k.a. "race records." Last night — in which each NYPL guest cued up both famed and obscure blues, jazz, and gospel tracks by Ethel Waters, Jelly Roll Morton, Buddy Boy Hawkins, and the Four Harmony Kings, among others — was proof that what makes the label's story so momentous is also what renders it bizarre. Music was never their true focus, despite the high-caliber talent it uncovered in its 15-year run (Ma Rainey, Alberta Hunter, early Louis Armstrong, Charley Patton, Blind Lemon Jefferson). "That they captured this beautiful moment in culture was completely accidental," White said. "They didn't use good-quality acetates for their 78s. They tried to record just about anyone who crossed their path until they hired a guy named Mayo Williams, a bootlegger whose connections brought in great artists. His nickname was 'Ink,' 'cause he was good at getting people to sign contracts." 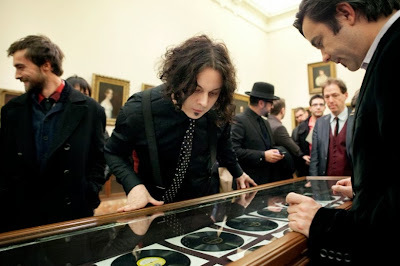 Those in attendance could also visit display cases at the rear of the room and view some of the gleaming Paramount 78s housed in the library's permanent collection, as well as the label's early graphic catalogs, obvious precursors to the comics of illustrator and record enthusiast R. Crumb. There was a bonus for attendees: Everyone received a custom-pressed 78-RPM disc of two sermons from the Paramount catalog. White self-identifies as an altar boy, after all.